Summer is finally here! If you’re looking for a cool, delicious treat on a hot day, or a fun activity to do with the kids, look no further than NO-CHURN ICE CREAM: Over 100 Simply Delicious No-Machine Frozen Treats; a mouthwatering collection of easy recipes for ice creams, sorbets, and gelatos - no ice cream machine necessary! Crafted by culinary powerhouse Leslie Bilderback (author of the bestselling Mug Cakes), inside you'll find recipes for all the basic flavors, plus more complex and exciting flavors such as Pineapple-Peppercorn and Sweet Potato Marshmallow Swirl. All you need is a freezer, a whisk, a freezable container and a sweet tooth! My Thoughts: I have to admit...we are ice cream junkies here at our home. We actually own 2 different ice cream making machines. With that said, there are days when I don't have a lot of time to whip up a quick frozen treat for my family. When I saw the title of this cookbook...I knew I had to review it for all of you. 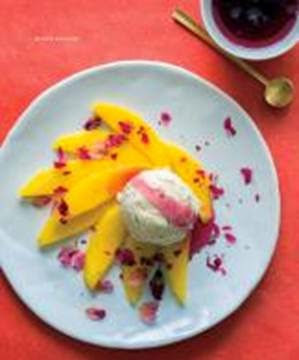 There are 168 pages in this cookbook with over 100 simple & delicious no-machine needed frozen treats. Many have color photographs that accompany the recipe. There are recipes for the classics, add-ins, warm-weather ice creams, cold-weather ice creams, gelatos, sorbets, sherbets, other frozen desserts and there are several recipes for various toppings. Yup...something for everyone!!! One of my family's favorites is a good batch of homemade chocolate ice cream. Every time I've made it in the past I've had to drag out my electric ice cream machine, assemble together a bunch of ingredients and then about 1 1/2 hours later we had our ice cream. Well...on page 16 in the cookbook the author shows you how to make classic chocolate ice cream without a machine! You only need 8 standard ingredients to make it. Oh my...impressive! 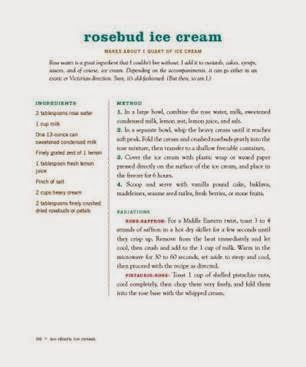 Further in the book you will find this recipe for homemade Rosebud Ice Cream. Yes...rosebud ice cream! That is definitely on my must-try list! I love how every recipe includes ingredients that I am familiar with, step-by-step instructions, variations and tips to help guide you through the preparation process. Anyone can make these recipes! I just love this book and I look forward to try many of the recipes throughout the summer season! Purchasing Info: You can buy this book in paperback form or for Kindle from Amazon.com. 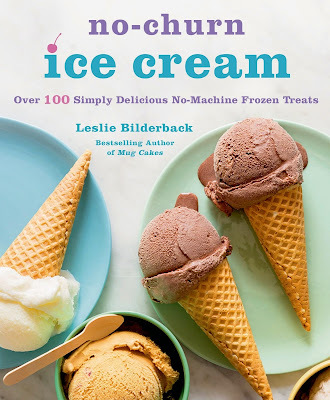 Giveaway: One lucky winner is going to win a print copy of No-Churn Ice Cream by Leslie Bilderback. The book will be shipped to the winner after the giveaway concludes. Giveaway Details: This giveaway is open to residents of the USA ONLY who are age 18 and over. Please read the Terms of Service and Disclaimer Policy before entering. This giveaway will close on June 3rd, 2015 at midnight EST time. Disclaimer: Shelly H. has personally reviewed the product listed above. Shelly has not received any monetary compensation for her review. Shelly did receive a free product to try out so she could evaluate and use it for her review. Her thoughts & opinions in this review are unbiased & honest and your opinions may differ. The Shakin N Bakin Blog is not responsible for delivery/shipping of giveaway items won from this blog nor are we responsible for mis-use or injury caused by items won from this Blog. Content on this blog is copyrighted, all rights reserved. We reserve the right to legally pursue anyone who violates our rights and/or steals our copyrighted material. I like good old fashioned vanilla bean! But it has to be Organic! I entered the TCC Ziploc brand Storage Bags sweep. Favorite ice cream flavor is chocolate and peanut butter. I love licorice ice cream. I follow SNB via GFC as hwb277. tcc - i entered -- Ziploc brand Storage Bags. I entered the TCC Juice Plus prize pack giveaway. I entered the TCC Dreft Laundry package giveaway. I love banana creme pie ice cream. I am always down for a bowl of French Vanilla ice cream! MMM! i entered the Ziploc brand Storage Bags sweep on tcc. I entered the TCC Ziploc Storage bags giveaway..
tcc - i entered the -- Ziploc brand Storage Bags. I am very conventional; I like chocolate ice cream best! tcc - i entered the -- Ziploc brand Storage Bags today. I entered the TCC $50GC to ShoeBuy.com giveaway. i entered -- Ziploc brand Storage Bags on tcc. I entered the TCC BEST Baby Food cookbook giveaway. tcc - i entered today -- Ziploc brand Storage Bags. i just entered -- Ziploc brand Storage Bags on tcc. I love strawberry swirl ice cream. I entered the SNB: Preservation Society Home Preserves Book giveaway. I entered the TCC Crane Cool Mist Humidifier. on tcc - i entered -- Ziploc brand Storage Bags. I entered the TCC Ziploc brand Storage Bags giveaway. I entered the TCC Ziploc giveaway. I entered the TCC Zoonicorns giveaway. I entered the TCC Charles River Park and Go jacket. I entered the TCC Liquid Palisade by Kiesque giveaway. My favorite flavor of ice cream changes from day to day. Today I would say Teaberry. I entered the TCC giveaway for the Magic Castle Bounce House. 8 entered the Zoonicorns giveaway on the TCC site. I entered the TCC giveaway: Best Baby Food book by Rose.